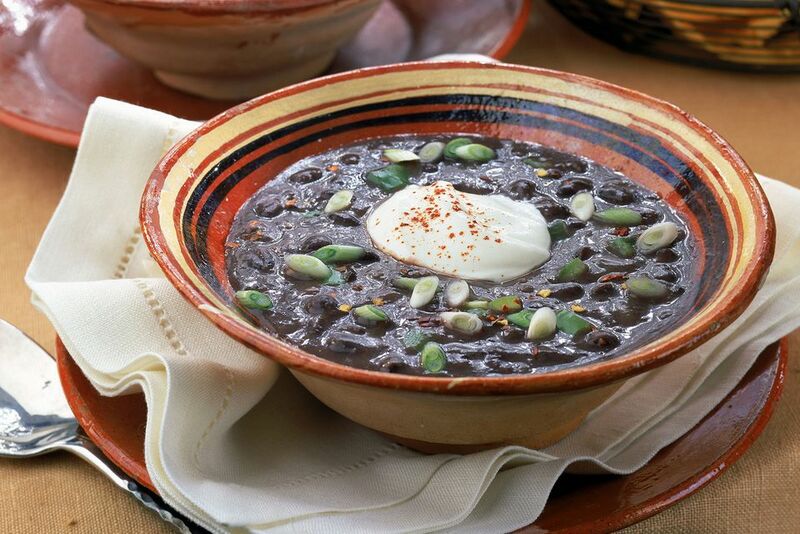 This black bean soup recipe is nicely flavored with garlic, a meaty ham bone, and spices. The soup starts with dried black beans, soaked and then simmered to perfection with a ham bone, chopped seasoning vegetables, and a variety of spices. A small amount of dry sherry or white wine is added to the soup, but it may be omitted if you prefer to make it with no alcohol. Top each serving of soup with a spoonful of sour cream and chopped green onions or chilled salsa. Soak the beans following the directions on the package for an overnight soak or quick soak. In a stockpot, Dutch oven, or large kettle, heat the olive oil over medium heat. Add the minced garlic, onions, and celery; cook, stirring, until the onions are translucent. Add the chicken broth, ham bone, the black beans, and the bay leaf. Reduce the heat to low, cover the pan, and simmer for 1 hour. Add red bell pepper, cumin, cayenne pepper, salt, black pepper, brown sugar, lemon juice, and sherry. Simmer the soup for 20 to 30 minutes. Puree about one-quarter to one-third of the soup and then return it to the pot. See below for how to puree hot soup safely in a blender. Remove the meat from the bone and dice it. Add it back to the soup. Top each serving with a dollop of sour cream and ​a sprinkling of chopped green onions. The steam from hot liquids can cause the lid to blow the lid off the blender, so it's important to work in batches. Never fill the blender more than half full. We recommend one-third. Loosen the center cup in the lid and hold a folded dish towel or pot holder firmly over the lid as you process the soup.